I never thought a day would come where I could go rockpooling in the middle of an arboretum but, through the power of television and the expertise of the National Marine Aquarium, a ‘mockpool’ tank of intertidal organisms was fashioned for the Autumnwatch Unsprung programme. As is often the case with television, I found myself coming away from the filming thinking of all the things I could or should have said. So in this blog I’ve decided to expand a little on some of the themes I touched on. First, I have to mention what a prolific ‘mockpool’ that was, which is not to say that the real thing doesn’t have a similar level of diversity and species. However, the chances of seeing species so clearly are lower because they are likely to dart into any crevice as soon as you approach a real rockpool. The vibrations of your feet on the rocks are enough to cause even the most ‘aggressive’ of crabs to hide! So it’s always a good idea to sit quietly and watch a rockpool for a while to see what might emerge from the safety of seaweed and rocks. It’s the combination of the chance element of discovery and the thrill of exploration that makes rockpooling such a delight. Snakelocks Anemone. An intertidal beauty. The Snakelocks Anemone in the ‘mockpool’ tank was a beautiful specimen, with its long fleshy green tentacles and purple tips. It certainly looked as though it hadn’t gone without a good meal in its comfortable surroundings. On the programme I mentioned the anemone’s rather intriguing adaptation of using its mouth both as its bottom and as the orifice from which it releases its egg and sperm. However, the story does not end there, they also bud to reproduce a perfect miniature form of themselves. These anemones are found around the majority of the British coast but are rarely (if ever) found on the east coast of England and Scotland or the easterly parts of Ireland. 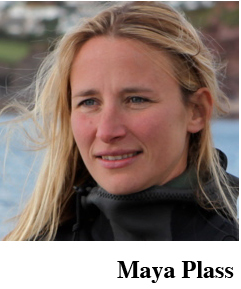 However, with warmer temperatures and changing currents in our seas the distribution of species is changing. The vivid coloration of the Snakelocks is in part due to the presence of algae that love sunlight, which live in the tentacles. You will tend to find these anemones in the sunnier patches of rockpools. 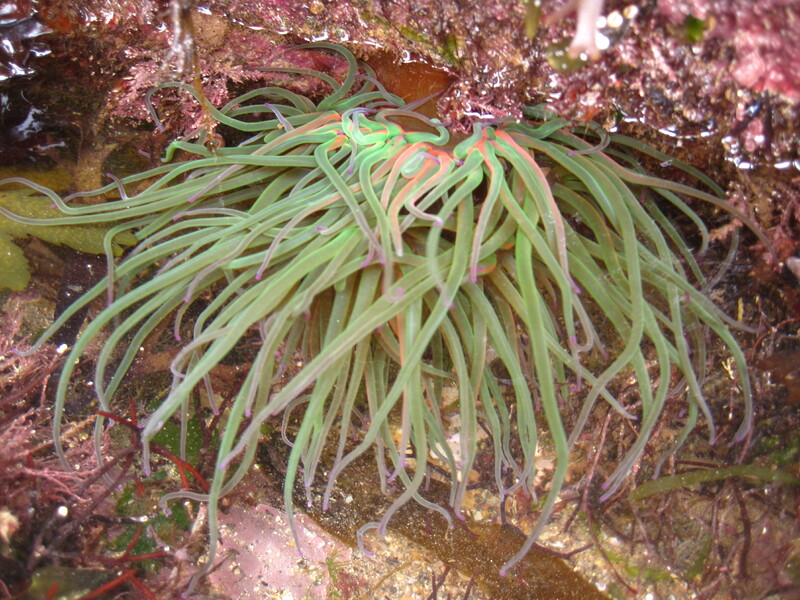 Unlike their cousins – the Beadlet Anemones Actinia equina – the Snakelocks rarely withdraw their tentacles to prevent themselves from desiccation on the low tide. The Beadlets will be found in shaded areas and can survive in areas where they will be left high and dry over the tidal period – in rocky, shaded crags for example. There is also a brown, paltry form of Snakelocks Anemone that is more common in areas protected from the harsh rays of the drying sunlight. But, as with the colourful algae-filled Snakelocks, the brown form will mostly be found in the pools even on the lowest of tides. This anemone was thought to lack the presence of the algae, but it is now thought to possibly even be a different species. Cushion Stars will dry out if left out of the water for any period so replace in pools as quickly as possible. 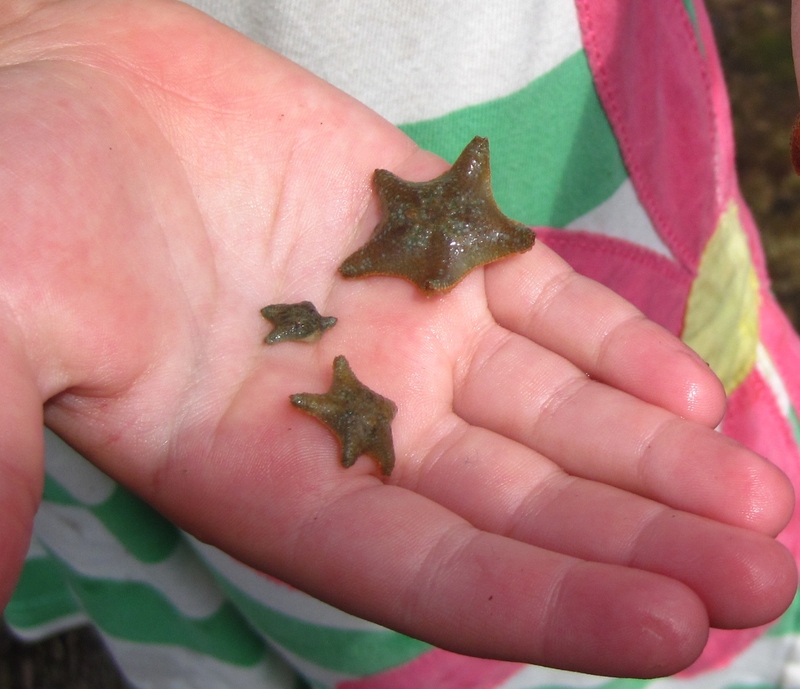 There were also some small, but always popular, varieties of starfish within the ‘mockpool’. 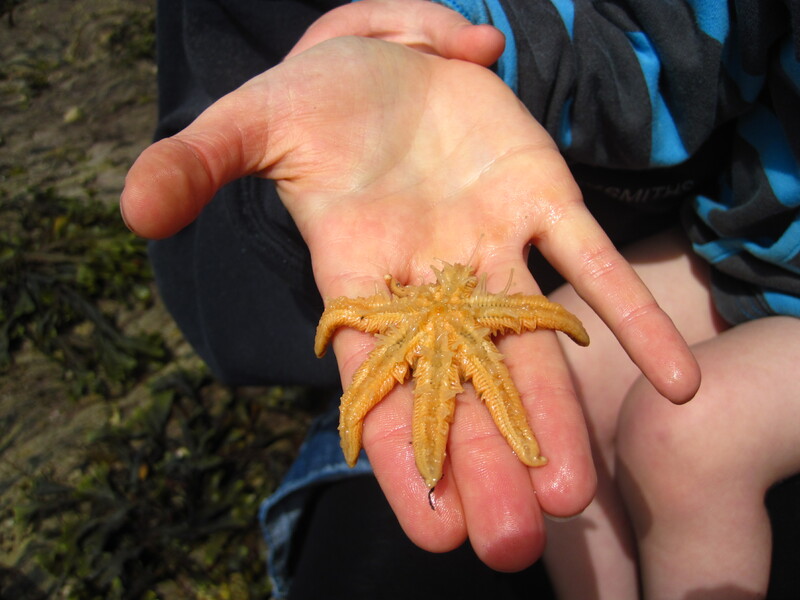 Hidden in the pool on the surface of the rocks and seaweed were a perfectly formed Cushion Star and Common Starfish. These always seem to capture the enthusiasm and delight of rockpoolers, young and old. They have some amazing adaptations, with tube feet on their underside that they control with hydraulic pressure. They use these tube feet to glide seemingly effortlessly around the surfaces of rocks and seaweed. Seven-armed Starfish – the tube feet of the starfish, which they use for locomotion and predation, are clearly visible. The Common Starfish – the larger, orange specimen – also use their hydraulic tube feet to predate on their food. They will give an unsuspecting mussel a seemingly affectionate hug, enveloping the mussel in their strong arms, attaching the many tube feet that run the length of their five arms to the mussel’s shell. Once the starfish has a good grip it gently prises the mussel shell apart. It then ejects its stomach from its mouth in a bizarre and, for some, disturbing way and digests the mussel within its own ‘protective’ shell. In times gone by if fishermen found these starfish eating their commercially valuable mussels they would peel off the starfish and rip them in two. But in unforgiving tidal and marine environments the starfish have adapted to withstand the pressure of harsh waves and predation using the powers of regeneration – they will quite simply re-grow lost limbs and it’s not uncommon for their usual pentameral symmetry to be broken by a shorter, ‘stumpier’ arm. I could tell you so much more about the incredible adaptations of the organisms that are found in the intertidal zone, but I’d better save some facts for my book, the RSPB Handbook of the Seashore, coming in early 2013. I am looking forward to being able to really expand on the amazing stories that these wonderful beasts have to tell. By the end of the writing months, I hope to have so many more new facts for you to read, but also to maintain my chances of ‘out-geeking’ the knowledge fountain that is Chris Packham! You can watch clips of Autumnwatch Unsprung’s ‘mockpool’ on the BBC iPlayer via these links – the marine sections are at 6.20, 15.00 and 24.45 minutes (UK only).